Iran has declared that Kalaye Electric, in Tehran, was a primary centrifuge research and development, and manufacturing site until operations moved to the Natanz site in 2002. The name “Kalaye Electric” means “electric goods,” implying that the name was chosen to help disguise the true purpose of the facility. Iran has declared that Kalaye Electric became the primary P1 centrifuge development and testing site after such work was moved after 1995 from the Tehran Nuclear Research Center. The IAEA has reported that between 1997 and 2002, Iran assembled and tested P1 centrifuges at Kalaye. Iran also says it introduced UF6 gas into a centrifuge for the first time in 1999 and, in 2002, fed nuclear material into a small, 19-machine cascade. Iran used 1.9 kg of imported Chinese UF6 to test centrifuge machines at the Kalaye Electric Company workshop between 1999 and 2002, before the dismantling of the test facility at the end of 2002. After the Pilot Fuel Enrichment Plant at Natanz became the primary centrifuge research and development facility, Kalaye Electric remained a main component manufacturing site. After the public revelation of the existence of Kalaye electric (first called Kala Electric), a media report said US satellite imagery showed equipment being removed from the site and other activities that raised suspicion that Iran was trying to hide activities before granting access to the IAEA. The IAEA asked to visit Kalaye in February 2003 and asked to take environmental samples to determine if any enriched uranium was produced at the site. Iran responded that the facility is a watch factory, but that it also makes a few centrifuge components. It initially denied the inspectors’ requests to take environmental samples, claiming that it did not have to allow access until Iran implemented the IAEA additional protocol. Iran subsequently reconsidered and allowed the IAEA limited access in March 2003 and full access in May, but it refused to permit environmental sampling. Iran refused to allow environmental samples until August 2003. Iran took extraordinary steps to disguise the past use and purpose of this facility. These steps included removing equipment and moving internal walls. Nonetheless, the IAEA was able to detect enriched uranium at this site, further pressuring Iran to truthfully declare its activities there. The satellite image of Kalaye Electric was taken January 30, 2005 by DigitalGlobe’s Quickbird satellite. The picture shows the centrifuge research and development facility within a walled area that contains two large workshops and some smaller buildings. 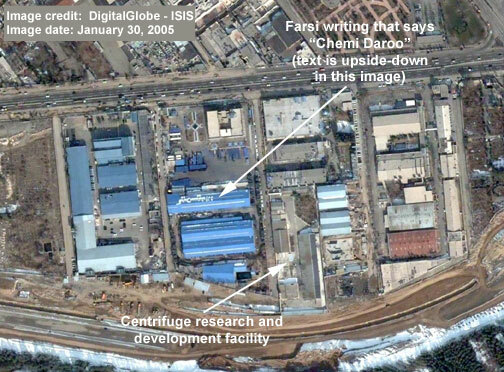 Next to the centrifuge facility is a building with the words “Chemi Daroo” written in farsi on the roof, which confirms the location as described by NCRI.